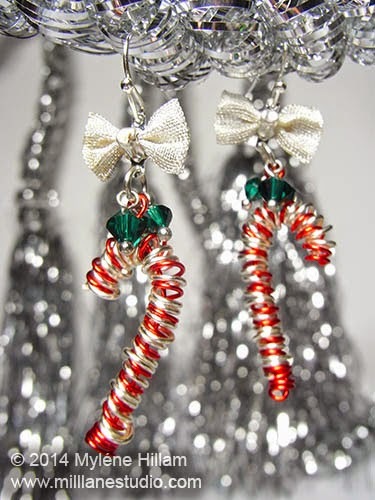 I had so much fun making today's Whimsical Candy Cane earrings. 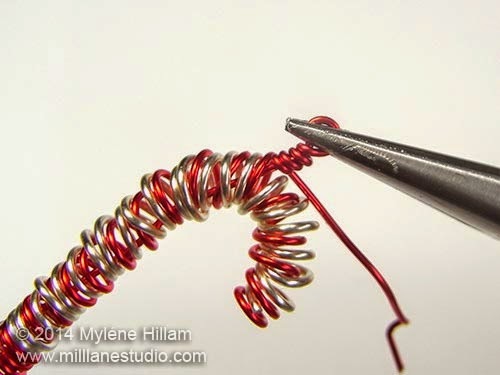 With nothing more than a skewer to form a wire coil, you can create your own wire candy canes in under an hour. 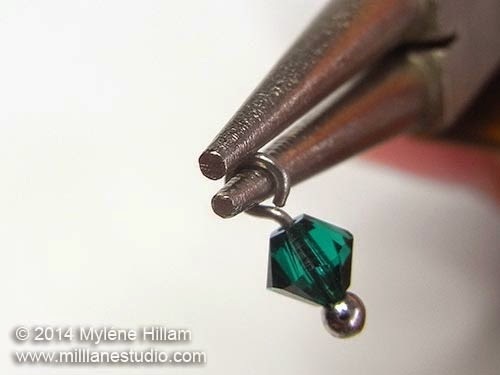 This is a very simple technique but the end result is amazing. Cut a 35cm (14") length of each of the two wires. Line up one end of the red wire with the point of the skewer. 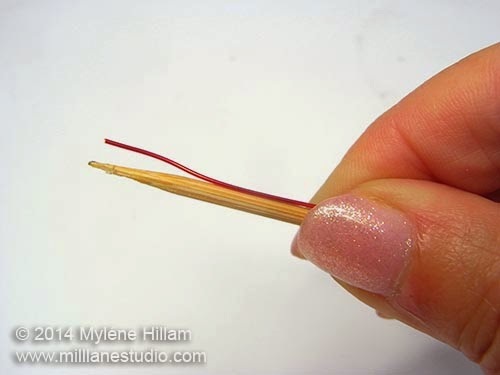 Wrap the wire around the skewer starting about 2.5cm (1") from the tip of the skewer. 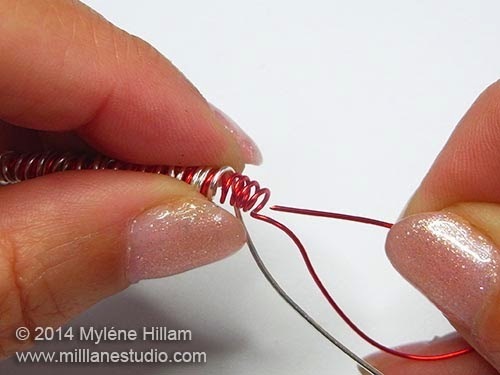 Wrap the wire firmly but not too tightly or it will be difficult to remove later on. Make about 6 or so wraps. 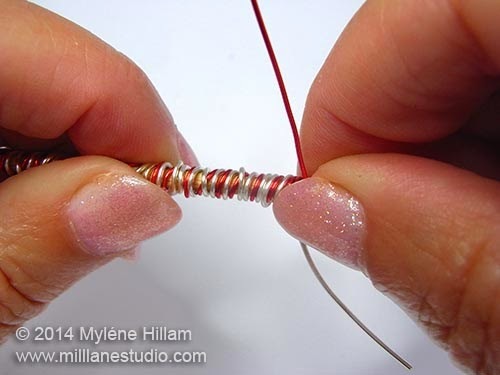 Line up one end of the silver wire with the skewer tip and begin wrapping it in between the red coils: one wrap in the odd coils and two wraps in the even coils. The silver wire will cross over the red wire on the even coils but don't worry because it just adds to the whimsy of the design. 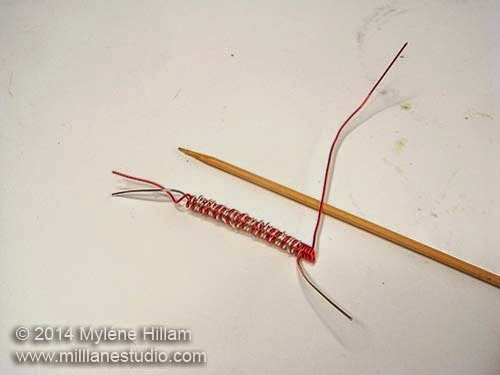 Continue wrapping the red wire around the skewer about six more times and then wrap the silver wire inbetween as before. 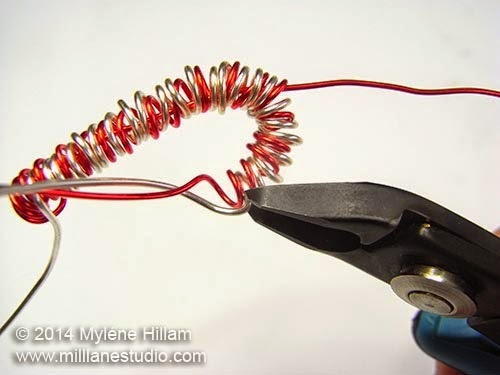 Continue until there is only a 2.5cm (1") tail of silver wire left. 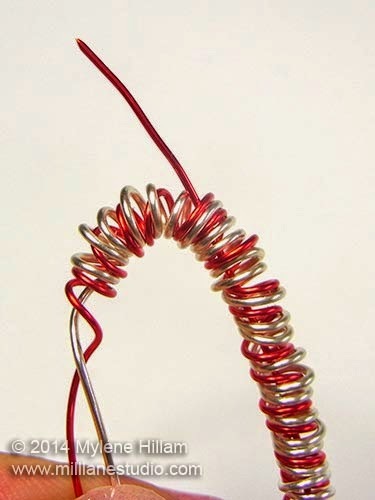 Finish with three red coils. .....and then slide the coil off the skewer. 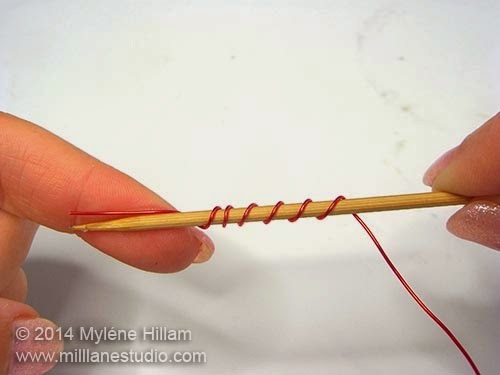 Gently bend the top of the candy cane to create the hook. 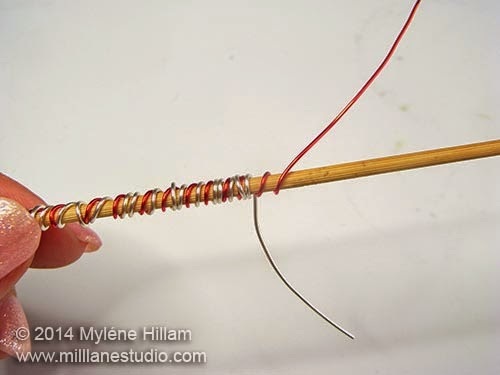 Insert the long red tail inside the coil until it reaches the top of the bend. Pull the wire part way out at the top of the hook between the coils. The rest of the tail will be pulled out shortly. This will become the hanging loop. 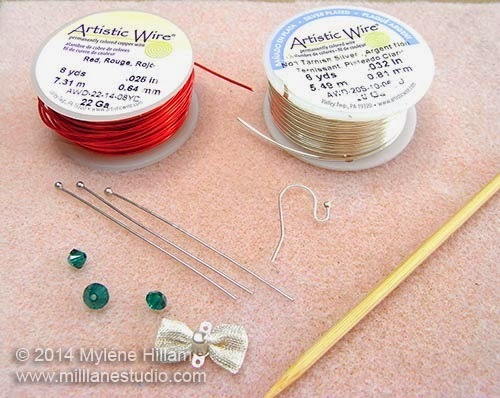 Trim away the excess red and silver wire at the end of the candy cane and the silver wire at the bottom. 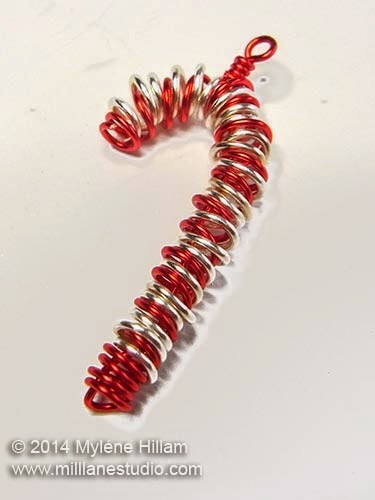 Pull the red wire all the way out of the top of the candy cane taking care not to kink the bottom coil. .....and then wrap the tail around the neck two or three times. 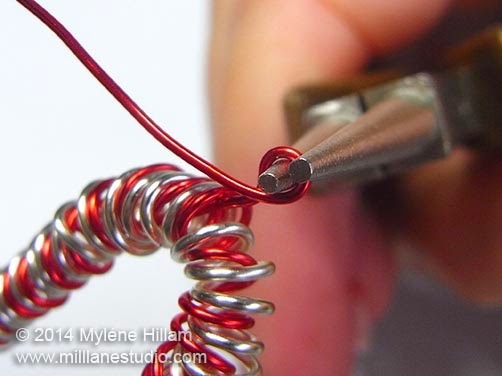 Trim away the excess wire so that you have a neat finish. You may need to adjust the shape of the candy cane a little but it's best to do this when you have created a second candy cane so that they match. 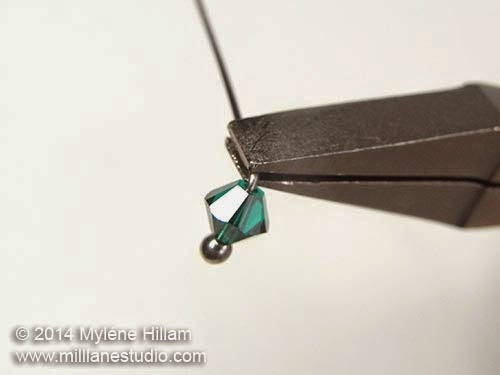 String a bicone on a head pin and bend it at a 90° angle with the flat nose pliers. Using flat nose pliers allows you to get in closer to the bicone than with chain nose pliers. 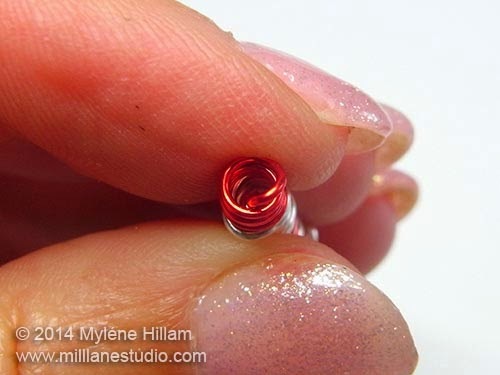 Trim the head pin to 1cm (3/8") and turn a simple loop. Repeat with the remaining bicones. Open the jump ring and hook on the 5mm bicone, the candy cane, the two 4mm bicones and the loop of the bow connector. 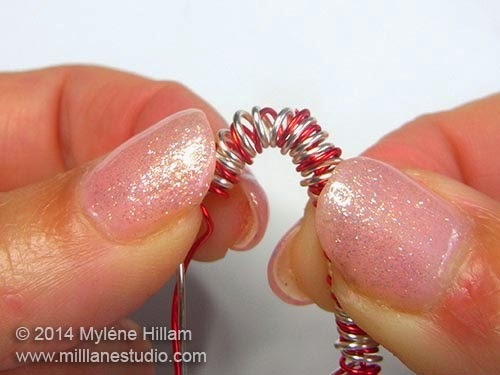 Attach the other loop of the bow connector to the earring wire. 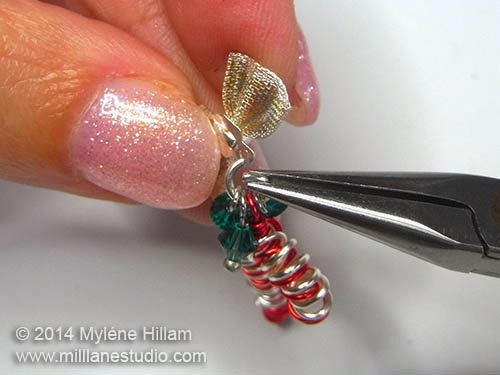 Create a second earring to match and then adjust the candy canes to the same shape and size. Play around with the angle that they hang at by bending the wrapped loop - whether they dangle at an angle or hang straight is up to you! I'll be back with Day 4's earrings early next week. In the meantime, I hope you have a great weekend!